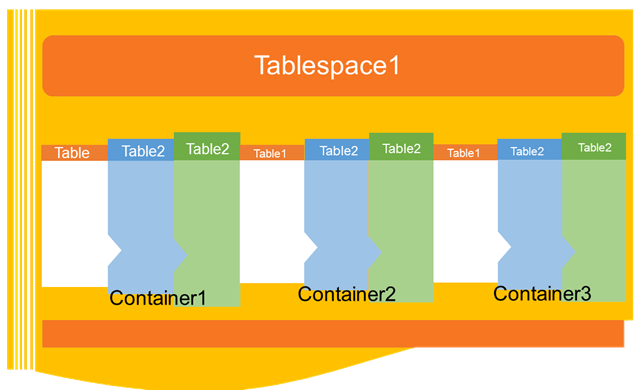 A DB2 tablespace is a storage structure which contains tables, indexes, large objects, and long data. It can be used to organize data in a database into logical storage group which is related with where data stored on a system. Tablespaces are stored in database partition groups. Recoverability: Tablespaces make backup and restore operations more convenient. Using a single command, you can make backup or restore all the database objects in tablespaces. Automatic storage Management: Database manager creates and extends containers depending on the needs. Memory utilization: A single bufferpool can manage multiple tablespaces. You can assign temporary tablespaces to their own bufferpool to increase the performance of activities such as sorts or joins. Tablespaces consist off one or more containers. A container can be a directory name, a device name, or a filename. In a database, a single tablespace can have several containers on the same physical storage device. If the tablespace is created with automatic storage tablespace option, the creation and management of containers is handled automatically by the database manager. If it is not created with automatic storage tablespace option, you need to define and manage the containers yourself. Catalog tablespace: It contains system catalog tables for the database. It is named as SYSCATSPACE and it cannot be dropped. User tablespace: This tablespace contains user-defined tables. In a database, we have one default user tablespace, named as USERSPACE1. If you do not specify user-defined tablespace for a table at the time you create it, then the database manager chooses default user tablespace for you. Temporary tablespace: A temporary tablespace contains temporary table data. This tablespace contains system temporary tablespaces or user temporary tablespace. System temporary tablespace holds temporary data required by the database manager while performing operation such as sorts or joins. A database must have at least one system temporary tablespace and it is named as TEMPSPACE1. It is created at the time of creating the database. User temporary tablespace holds temporary data from tables. It is created with DECLARE GLOBAL TEMPORARY TABLE or CREATE GLOBAL TEMPORARY TABLE statement. This temporary tablespace is not created by default at the time of database creation. Tablespaces can be setup in different ways, depending on how you want to use them. You can setup the operating system to manage tablespace allocation, you can let the database manager allocate space or you can choose automatic allocation of tablespace for your data. System Managed Space (SMS): The operating system's file system manager allocates and manages the space where the table is stored. Storage space is allocated on demand. This model consists of files representing database objects. This tablespace type has been deprecated in Version 10.1 for user-defined tablespaces, and it is not deprecated for catalog and temporary tablespaces. Database Managed Space (DMS): The Database Server controls the storage space. Storage space is pre- allocated on the file system based on container definition that you specify when you create the DMS table space. It is deprecated from version 10.1 fix pack 1 for user-defined tablespaces, but it is not deprecated for system tablespace and temporary tablespace. Automatic Storage Tablespace: Database server can be managed automatically. Database server creates and extends containers depend on data on database. With automatic storage management, it is not required to provide container definitions. The database server looks after creating and extending containers to make use of the storage allocated to the database. If you add storage space to a storage group, new containers are automatically created when the existing container reach their maximum capacity. If you want to use the newly-added storage immediately, you can rebalance the tablespace. Temporary DMS and automatic storage tablespaces, the page size you choose for your database determines the maximum limit for the tablespace size. For table SMS and temporary automatic storage tablespaces, the page size constrains the size of table itself. The page sizes can be 4kb, 8kb, 16kb or 32kb.